If you create an APEX form based on a table, APEX automatically creates processes of type Automatic Row Fetch and Automatic Row Processing (DML) as well as one item for each column in the table, each bound to the database column via its Source Type. This design is excellent as it’s fully declarative and is very quick and easy to build a data entry page for all your tables. The downside to this approach is that if you want to use a Table API (TAPI) to encapsulate all DML activity on your tables, you need to write a whole lot of code to replace the processes that Apex created for you. In order to mitigate this as much as possible, I’ve augmented my code generator with an “APEX API” generator. This generates a second package for each table which can be called from APEX, which in turn calls the TAPI to run the actual DML. In addition, the validations that are performed by the TAPI are translated back into APEX Errors so that they are rendered in much the same way as built-in APEX validations. By the way, my table creation script calls DEPLOY.create_table to do this, which automatically adds my standard audit columns to the table – CREATED_BY, CREATED_DT, LAST_UPDATED_BY, LAST_UPDATED_DT, and VERSION_ID. My script also calls GENERATE.journal for the table which creates a journal table (EMPS$JN) and a trigger (EMPS$TRG) to log all DML activity against the table. I then call GENERATE.tapi which creates the Table API (EMPS$TAPI) which has routines for validating, inserting, updating and deleting rows (or arrays of rows using bulk binds) of the EMPS table. Notice that these routines require no parameters; the API gets all the data it needs directly from APEX. Now, given the above package, we can create an APEX page that allows users to view, create, update, copy and delete a record from the EMPS table, using all the features provided by our TAPI. Create Page, select Form, select Form on a Table or view, select the table EMPS. Accept the defaults, or change them to taste, and click Next, Next. For Source Type, leave the default (Existing trigger). ** Click Next, Next, Next. For Branching, enter page numbers as required. Click Next, then Create. * the APEX API and Table API generator also handles tables with no surrogate key by using ROWID instead; in this case, you would leave the default option selected (Managed by Database (ROWID)) here. ** note however that our TAPI will handle the sequence generation, not a trigger. Notice that it has created a Fetch Row from EMPS process for when the page is loaded, as well as the Process Row of EMPS and reset page processes for when the page is submitted. It has also created a few validations. Notice also that all the items are named consistently with the column names; this is important as my APEX API package generator relies on this one-to-one mapping. You can, of course, add additional non-database items to the page – they won’t be affected by the generator unless the table is altered with columns that match. 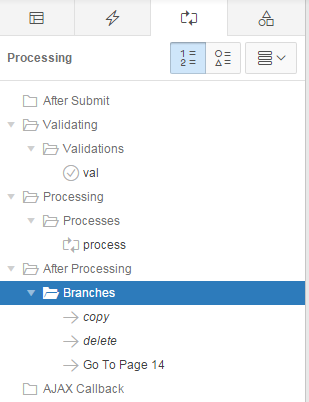 Delete all the Fetch Row from EMPS, Process Row of EMPS and reset page processes. For all the page items, set Source Type to Null. In Apex 5 this is easy – just Ctrl+Click each item, then make the change to all of them in one step! Make the audit column items (CREATED_BY, CREATED_DT, LAST_UPDATED_BY, LAST_UPDATED_DT) Display Only. Make the VERSION_ID item Hidden. Under Pre-Rendering, add an After Header process that calls EMPS$APEX.load;. In the Page Processing tab, under Validating, add a validation with Type = PL/SQL Function (returning Error Text). Set the PL/SQL Function Body Returning Error Text to EMPS$APEX.val; RETURN null;. Set Error Message to “bla” (this is a mandatory field but is never used – I think this is a small bug in Apex 5). 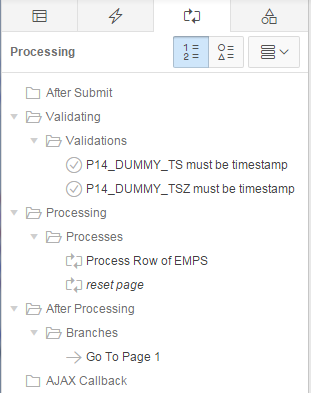 Under Processing, add a process that calls EMPS$APEX.process;. Set Error Message to #SQLERRM_TEXT#. Run the page – you should find that it works just as well as before, with all the TAPI goodness working behind the scenes. Even the validations work, and they will point at the right items on the page. But that’s not all! You can easily add a useful “Copy” function that your users will thank you for because (depending on the use case) it can reduce the amount of typing they have to do. Add a button to the region, named SAVE_COPY (this name is important) with the label Copy. Tip: if you want an icon set the Icon CSS Classes to fa-copy. Add a hidden item named after the PK item prefixed with “COPY_”, e.g. P14_COPY_EMP_ID. Under After Processing, add a Branch that goes to this same page (e.g. 14, in this example). On the branch, set Request (under Advanced) to COPY and assign &P14_EMP_ID. to the item P14_COPY_EMP_ID. Set When Button Pressed to SAVE_COPY. Now, when they click Copy, the page will first save any changes they had made to the record, then go back to the same page with a copy of all the details from the original record. The user can then edit the new record and Create it if they so desire, or Cancel. An advantage of this design is that, if you want to add a validation that applies whether someone is updating the table from APEX or from some other UI or interface, you can add it in one place – the TAPI (specifically, you would add it to the TAPI template). 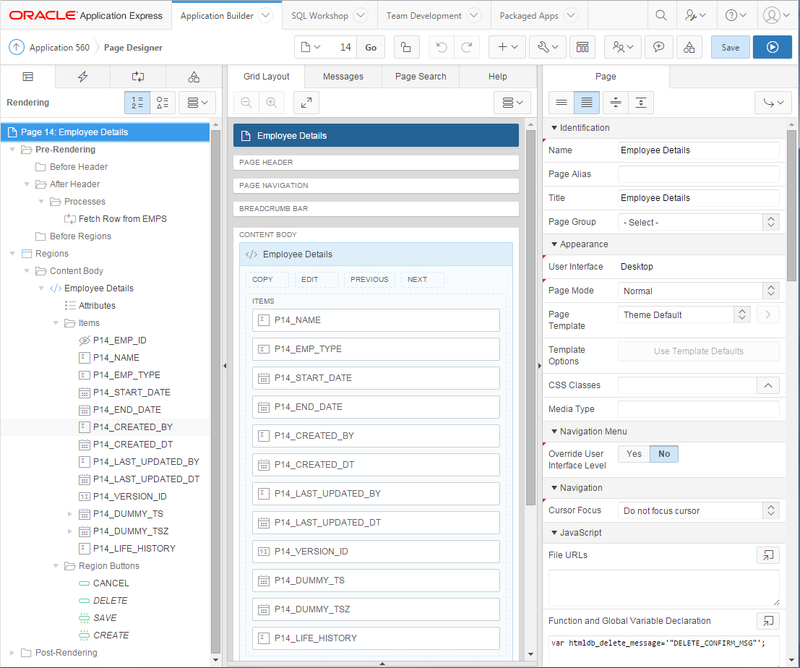 If you add a column, just add an item to the APEX page and regenerate the TAPI and Apex API. It’s a nice DRY-compliant solution. Addendum: you may be wondering why we need a P14_COPY_EMP_ID item, instead of simply reusing the P14_EMP_ID item that’s already there. The reason for this is that after saving a copied record, in some cases we may want to copy some or all the child records from the original record to the copy, or do some other operation that needs both the old and the new ID. Hi, this looks quite some and indeed work. Have you considered using extra table-views with instead-of-triggers as a ‘intermediate-layer’ between Apex page-logic and the data-tables? If not, in which way they would fall short for your purposes? Yes, indeed a view with instead-of triggers is potentially another way of providing some of the separation, but not entirely. It’s been a while since I last tried using them with Apex, though, and from memory (it was back in the HTMLDB days, IIRC) they did not play nicely. However, things may be quite different now so it’s certainly worth looking into. An advantage of using views and instead-of triggers would be that the PL/SQL would no longer need to call v() to get all the Apex items. However, the validation integration would not be any different (you’d still have to implement validation in the Apex application somehow). As far as I know “standard” DML-processing in Apex works seamlessly on views since 3.1 (I have never used any version before that). Other advantages using views are that you don’t have to replace the ‘standard’ row processing and that the standard (optimistic) locking check is still in place (I assume that locking will be lost when using the EMP$APEX solution, or you have built one in the TAPI?). BTW: you can of course still use the TAPI within the instead-of triggers and yes, you can setup the same (TAPI) validation processing. Yes, my TAPI includes protection against lost updates by comparing the VERSION_ID column for each update and delete.